You do not need a PayPal account to pay by Credit Card. The 2 Littre (70 oz.) WXP bladder hydration system, designed and built in Israel by Source® for the Israeli Army and chosen by the US Marine Corps. It is made from High performance 2L hydration reservoir system with exclusive 3 layer coextruded Polyethylene construction with Taste-Free™, low maintenance, Glass-Like™ liner and Integrated Grunge-Guard™ antimicrobial. The Source® hydration system is designed for extraordinary functionality and is compatible with almost all backpacks which contain an integrated pouch. The need for cleaning is eliminated, allowing simply refill and drink again and again for months. 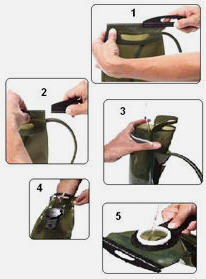 Note: This bladder is recommended for Most Eberlestock Packs and Condor Tactical Series packs, It fits in the main outboard pockets and in the narrow sleeve with the hydration hooks. Patented Leak Proof - Wide slide opening for easy cleaning, draining, ice insertion. TASTE-FREE™ System - Glass-Like™ Liner technology in reservoir and tube delivers pure liquid taste with no plastic flavour. Made in Israel By Source Vagabond Systems for Eberlestock USA.